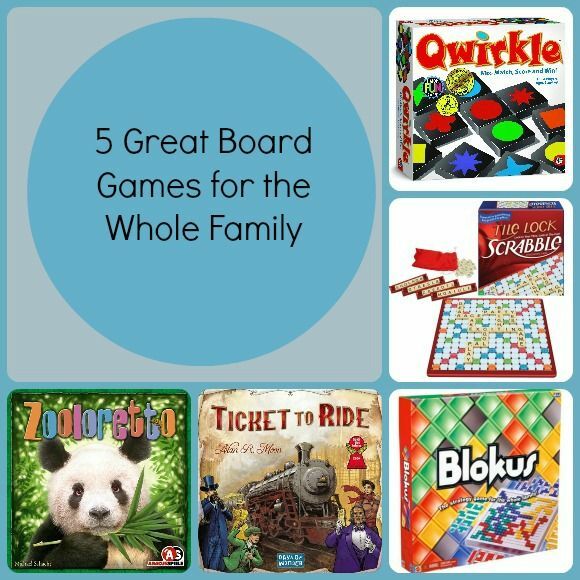 Are you looking for board games the whole family can play? Well, you are in luck because there are plenty to choose from! You and your kids will enjoy playing these board games. Some you may have heard of and others may be new to you. Mindware’s game, Qwirkle is one of those board games the whole family can play and has easy to remember rules. This family game begins with every player drawing six tiles. The player with the most tiles that share a common feature (same color or symbol) plays their pieces. Then, the next player takes their turn and in the end you will have made a huge grid. It is a great family game so little ones can learn colors, shapes, patterns, and matching. Older kids will learn strategy skills. Quirkle has won several awards and one game lasts about 45 minutes. A true classic, Scrabble is a board game that is still as popular today as it was back when it was invented, in 1931 (although it went by different names back then.) Children can learn new vocabulary words and work on their strategy skills, while adults will be equally as challenged to find words that will use all those vowels you end up with! We love the new Tile Lock version, because it prevents all your tiles from flying around the board while leaning across it to create those super high-scoring words. This is one of the most popular board games the whole family will enjoy and parents who nothing but positive things to say about it. Ticket To Ride is a family game that simulates a cross country adventure. Players collect and play matching train cards, which will grant you access to railway routes connecting cities throughout the United States. The longer your routes are, the more points you earn. Ticket to Ride is a very fun game that can be played again and again. taps into your creativity and has won a Mensa award for promoting healthy brain activity. To play this family game, players must fit all of their pieces on the board. However, it must be placed touching at least one corner of your pieces already on the board. Trust me, the game is much more challenging than you think! One of the games the whole family can play is Zooloretto , an animal board game. The goal is to build a zoo and to attract as many visitors to your zoo as possible. But be careful, if you have too many animals you might run out of room, which costs you valuable points. What are your favorite board games the whole family can play? We love Blokus….such a fun adult game, too. I agree! I really like games that people of all ages can play! Scrabble has always been our go-to family game. Even as small children, we played with the grown ups and were expected to keep up! My grandma was the best Scrabble player I ever knew and I always think of her when I play! My great-grandmother always played Scrabble with me and I really cherish those days they had! I’ve never even heard of a few of those, but our very favorite family board game is Monopoly. We have about 8 different versions of it from different cities that we’ve visited. Scrabble comes in a close second. I knew Monopoly had several, but I didn’t know it was 8 of them! Mary recently posted..Great Deal on Sam’s Club Membership + Coupons for Free Food Items & Gift Card! I hope you and your family enjoy these! Scrabble is one of our favorites, so happy that my oldest daughter can play now too. Great for learning new words and spelling! I credit Scrabble for increasing my vocabulary! We love Ticket to Ride and Blokus. Have you tried Settlers of Catan? I have not tried it yet, I will have to look into that one!